Gutter cleaning services for residential and commercial properties in London. We have a team of cleaning professionals, who are fully insured and licensed to perform gutter cleaning for residential and commercial premises. A blocked gutter will not only cause hindrance to the normal flow of water, but it can also create blockages and dams which may result in water spilling over the edge of the blocked guttering and staining the building. In addition, the dirt and silt that collects can lead to bad smells rising up and coming in through your windows; and nobody wants that! In such a situation, you probably don’t want to get your hands dirty, but you cannot wait any longer either. This is exactly where Water Damage crew can come to the rescue. With prompt assistance and fast turnaround, we do not let our customers suffer the consequences of blocked gutter any further. We get down to cleaning and clearing the gutter; thereby, getting everything back to normal in no time. Gutter cleaning requires specialised equipment and relevant safety experience for ensuring quick and best results. At Water Damage, we possess all the tools and equipment that are necessary to both access and undertake a gutter cleaning job like this. Safety is one of the main concerns when it comes to gutter cleaning. There have been many instances across the globe when professionals get injured during the course of gutter cleaning. This creates problem for both the service provider and the seeker. But when you commission Water Damage for the job, you need not worry at all. Our cleaning professionals are backed by public liability and indemnity insurance, which means you, as a customer, are not the one to take the onus if any mishap takes place. However, we take all the necessary safety measures so as to avoid such situations during gutter cleaning. Water Damage has been around in the industry for over 12 years and has garnered adequate experience in gutter cleaning and other specialised residential and commercial cleaning jobs. We can provide references and a portfolio for swift services and reasonable prices. We deliver the quality services which no other gutter cleaning London specialist can compete with. Our gutter cleaning professionals are IICRC and FLIR Level 2 accredited, which translates into quality services and minimum errors. All our experts are trained in their duties to perform gutter cleaning and always take care of your property in the process. We understand that the need for gutter cleaning in a city like London can arise anytime; therefore, we have made ourselves available on all days of the week; therefore, you need not panic if your gutter gets blocked unexpectedly on weekends. 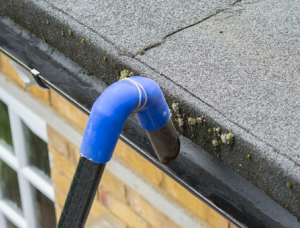 Instead of climbing up to the roof and performing gutter cleaning, we use specialised equipment that allows us to facilitate gutter cleaning while standing on the ground. This eliminates the risk associated with the job and procures satisfactory results in a minimal time frame. We at Water Damage can quickly get the dirt and debris cleared from the gutters to prevent annoying blockages; thereby, letting you enjoy the pleasant rainy weather and worry less about the blocked gutters.